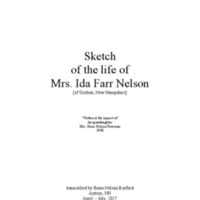 Memoir written by Ida Farr Nelson in 1940 when she was in her mid-80s . 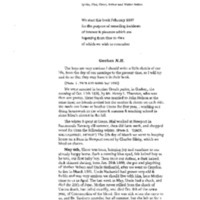 It was written at the request of her granddaughter Doris Nelson Newman and transcribed in 2017 by her great-grandson Brian Nelson Burford. The text includes information about Ida's own childhood in New Jersey and Pennsylvania, as well as her teenage and adult life in Goshen, New Hampshire. She includes some recollections of her sons' childhoods, and more information about their lives as grown men. A year before her marriage to Hial Nelson, Ida Farr served as "Editress" for what purports to be the March 13, 1875 issue of the weekly newspaper of the Hillsboro Lyceum Association. 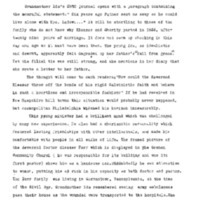 Ida herself wrote an essay titled "Home" for the Journal which also contains a generally humorous and flirtatious collection of poems, announcements, and conundrums. The Hillsboro Lyceum and its publications may well have served as a model for the family lyceum that Ida would later convene in the Nelson parlor. Listen to Part 2 of our interview with Beatrice Jillette, granddaughter of Elmer Nelson and current resident of Goshen, NH. 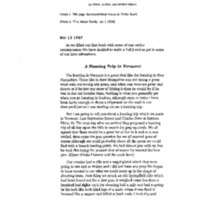 In this particular interview, Beatrice discusses the current state of imaginative play in Goshen, which Nelson brother she wished she had met/knew, her early encounter with Arthur Nelson, the resources available to the Nelson brothers during the 19th century, details about the Nelson family farm and creamery, her fondness for other Nelson relatives, and the beneficial nature of the Nelson brothers’ juvenilia collection. Check out Part 1 of our interview with Beatrice Jillette, granddaughter of Elmer Nelson and current resident in Goshen, NH. In this interview, she discusses her decision to move to Goshen from NYC, her various jobs held while living in Goshen for 50 years, the history of the Nelson family reunion, her archival work with the Goshen historical society, her feelings about her grandfather, growing up in the 19th century, and her reaction to the discovery of the Nelson brothers’ juvenilia. Elmer's Hunting Diary includes stories about his hunting excursion with Uncle Oren, Arthur, Walter, and his father on Nov. 18th-19th. The account details the boys' successful hunting of hedgehogs, their construction of a campsite, and preperation of meals. 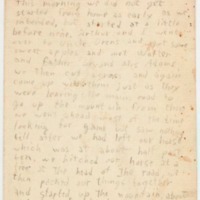 In March of 1897, Elmer, Arthur, and Walter state that they wrote Sketches of Our Home Life Vol. 2 to “get in some of [their] later adventures.” These adventures include accounts of hunting and camping trips around New Hampshire, descriptions of the Nelsons’ “ideal camera,” “The Three Great Snow Storms of 1898,” and their perspective of the Spanish-American War. The Worcester/Boston Trip consists of original diary entries (eventually copied by the Nelson brothers into Sketches of Our Home Life, Vol. 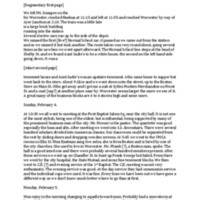 2) that provide a detailed account of a trip to Worcester and Boston by one of the brothers. The diary entries include details about the boys’ train rides, meeting at the First Baptist Salem Sq., a trip to a YMCA to see their first basketball game, as well as trips to the County Jail and Art Museum with Aunt Sadie. 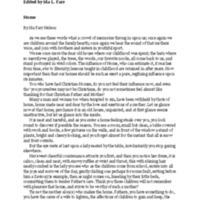 Prologue to Ida Farr's 1872 journal written by her granddaughter Doris Nelson Newman. It provides illuminating context and family history, especially about Ida's parents Eleazer Farr and Charity Tandy, and about Ida's own childhood in Philadelphia. 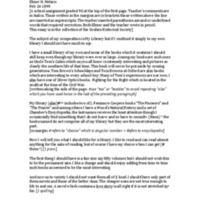 My Library is a school essay written by Elmer Nelson and corrected by his teacher, describing his personal collection of books and his passion for travel and adventure.